Las Vegas (the Meadows or grassland) was a name given by the Spaniards who used water in the area while heading north and west along the Old Spanish Trail from Texas. In the 1800.s areas of Las Vegas Valley contained artesian wells that supported extensive green areas or meadows.John Freemont travelled into the valley in 1844 when it was still part of Mexico. He was a leader of a group of scientists, scouts and observers for the U S Army Corps.In 1855 following the annexation to the U S, Brigham Young sent 30 Mormon missionaries to convert the Paiuti Indian population. A fort was built near the current down town area, serving as a stopover for travellers between Salt Lake City and a colony at San Bernardino, California.Las Vegas established itself as a railroad town in 1905 when 110 acres were sold off. The Bellagio is owned by MGM Mirage and was built on the site of the Dunes hotel and casino. It was inspired by the Lake Como resort of Bellagio and cost $1.6 billion to build. The main feature of this ultra luxury rated hotel is a 9 acre artificial lake between its buildings and the Strip. 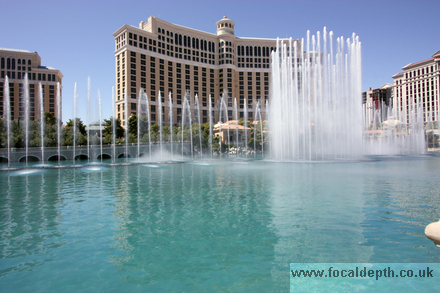 The Fountains of Bellagio are serviced by a fresh water well that was made many years ago to irrigate a golf course that used to occupy the site. There is a network of pipes with more than 1200 nozzles and 4500 lights which are used to produce brilliant choreographed music shows.The Fountains themselves cost about $75 million and were created by WET. Three types of nozzles are used, Oarsman, Shooters, Super Shooters and Extreme Shooters- the latter blasts water 500 feet in the air. The hotel opened October 15th 1998, has 3,933 rooms and employs about 10,000 people. Other features of the hotel include 2,000 hand blown Italian glass flowers by Dale Chihuly called "Fiori di Como" on the lobby ceiling, a Conservatory and Botannical Garden which displays change seasonally and a Fine Art Gallery. It is an AAA Five Diamond, Mobil Five Star rated luxury hotel and casino.